"Chelsea Clinton is a married woman! The world has watched the former first daughter blossom from a curly-haired teenager to a gorgeous, self-confident lady. So, it's no surprise the masses were consumed with the details of her and Marc Mezvinsky's wedding. And while photos of the blushing bride have already hit the internet, there is one facet of the affair that has wowed the world - her wedding gown. It looks like the former first daughter said yes to not just one, but two fabulous dresses. According to the New York Times, the current Mrs Mezvinsky walked down the aisle in a piece that "consisted of a number of yards of ivory silk organza that had been lightly gathered, with tulle pleated diagonally on the bodice." The dress was offset by a sparkling silver waistband, which added a bit of flair. 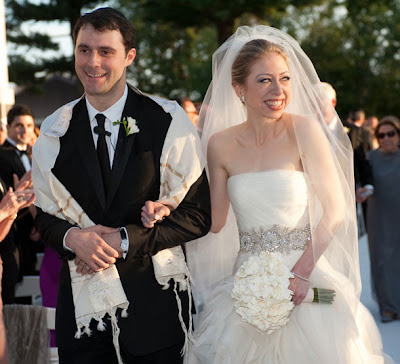 For the reception, New York Magazine reports that Chelsea showed off a Grecian goddess-inspired gown created from ivory silk tulle, which featured a crisscross back and black belt. It sounds breathtaking! Of course, not every lady needs to hail from political royalty in order to look like a princess on her wedding day. Girls who search early are bound to find the dress of their dreams." These dresses from TJFormal have the basic look of Chelsea's and the prices you have are FABULOUS! Those are really pretty gowns. I think with a little imagination any bride can look like a celebrity without spending a fortune.